SASSANIAN EMPIRE. Ardashir I, A.D. 223-240. AR Drachm (4.25 gms, 25 mm), Ctesiphon Mint (? ), ca. 233-239 A.D. Condition AU or almost FDC. Göbl type III/2/2. Sun­rise 714 or Sunrise-713 (further research required). Diademed bust right wearing close-fitting globular crest headdress and korymbos; Reverse: Ornate fire altar with ribbons. The Sassanian Empire encompassed modern-day Iran, Iraq, Afghanistan, and Armenia, as well as portions of Syria and Turkey. To the Sassanian people, they were called "Eranshar"-- the "Iranian Empire." Ardashir I or Ardeshir I (Ardaxšīr; New Persian: اردشیر بابکان, Ardashir-e Bābakān), also known as Ardashir the Unifier (180–242 AD), was the founder of the Sasanian Empire. After defeating the last Parthian shahanshah Artabanus V on the Hormozdgan plain in 224, he overthrew the Parthian dynasty and established the Sasanian dynasty. Afterwards, Ardashir called himself "shahanshah" (King of Kings)and began conquering the land that he called Iran. 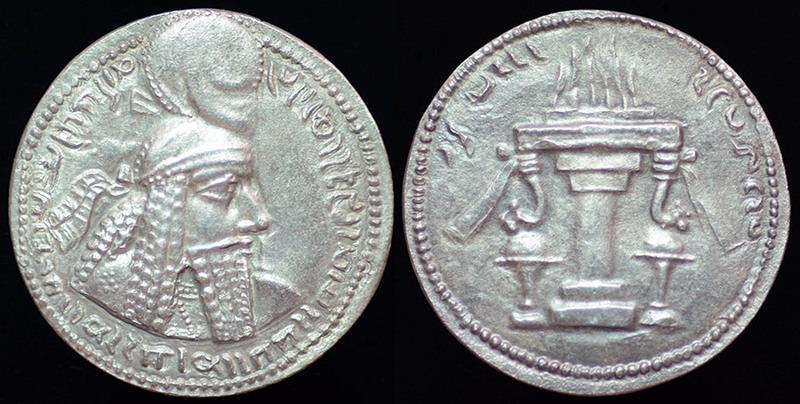 The reverse of the Sassanian coins usually show the Zoroastrian Fire alter; for Ardashir I the alter or "ATAR" is show without attendants. See the Moneta Museum (Next Image) for an example of all later rulers that have two flanking attendants. Atar (Avestan ātar) is the Zoroastrian concept of holy fire, sometimes described in abstract terms as "burning and unburning fire" or "visible and invisible fire" (Mirza, 1987:389). It is considered to be the visible presence of Ahura Mazda and his aša. The rituals for purifying a fire are performed 1,128 times a year. In the Avestan language, ātar is an attribute of sources of heat and light, of which the nominative singular form is ātarš, source of Persian ātaš (fire). It is etymologically related to the Avestan āθrauuan / aθaurun (Vedic अथर्वन् atharvan), a type of priest. It was later copied by the Latin ater (black) and possibly a cognate of the Slavic vatra (fire). In later Zoroastrianism, ātar (Middle Persian: ādar or ādur) is iconographically conflated with fire itself, which in Middle Persian is ātaxsh, one of the primary objects of Zoroastrian symbolism. Keywords: Sassanian Ardashir I 223 - 240 A.D.